Civic Insight is a centralized platform that helps citizens find information about their city and work together to improve neighborhoods in their city. Formerly called BlightStatus, Civic Insight was launched by Code for America as a tool for tracking vacant properties. Under the leadership of Alex Pandel and Eddie Tejeda, the service transformed into a successful start-up business called Civic Insight. Its GIS platform hosts a city's property information and shows where property is changing over time. Civic Insight's service runs on the Esri ArcGIS Online platform, which makes data accessible, simple to map, and easy to understand. From the City of New Orleans' website (www.nola.gov/code-enforcement/find-a-blighted-property), residents and local organizations can search for a property on a map and learn about its ownership, inspection, and permitting history. They can also ask to receive real-time notifications about construction progress. Civic Insight provides a community platform that lets citizens and local government officials see property activity and status. Before Civic Insight, people who lived in a neighborhood near new construction could not find out what was being built and who was building it. Now, any resident can go to the city's website and, through a map interface, get information about construction in a given area. Civic Insight makes it easier for the average person to understand permit information. The user accesses permit information, and Civic Insight shows this data on a simple map. Civic Insight partners work directly with local governments that authorize access to the city's system for issuing permits and inspecting code violations. Civic Insight then translates the information from government-speak to citizen-speak. Civic Insight improves day-to-day communications because it is integrated with the New Orleans systems and more people are able to share and combine data with other city information. 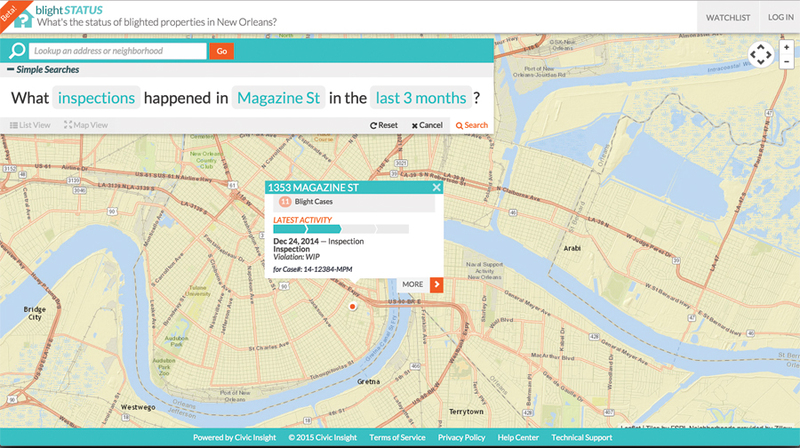 Like most US cities, New Orleans already uses Esri technology to manage its data. Civic Insight builds on the existing information infrastructure, whether it is Esri technology or another system, and uses the city's existing tiles and layers.